Come and join in the fun in these relaxed, informal music, sign and song sessions. All the signs taught through our course are British Sign Language signs, so you will also learn the basis of a new language. By the end of the 5-week course you will feel confident using around 250 key signs with your baby! Join Happy Ears the Rabbit, Rameez the Hippo, Martha the Monkey and a host of other friends to discover the wonderful world of baby signing. We know that babies love puppets, music, peekaboo, exploring different textures and playing with toys. So, we build all of this into our sessions. Signing is a wonderful way to communicate with your little one before they can talk. It is widely recognised by speech and language experts as helping to encourage development of a child’s speech. Baby Signing can also reduce tantrums in toddlers by half! Babies use signs and gestures as a natural part of learning to talk. By teaching extra signs, such as for milk, tired, and nappy, you will help reduce frustration (theirs and yours! ), encourage them to recognise important words and ‘talk’ to you before speech. 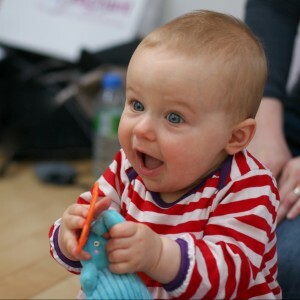 Our classes are limited to 10 parents and babies so book early to avoid disappointment! Parents who have been on a full 5-week block already are welcome to drop in for just £5 per session. The first three weeks of the course we build up our knowledge of the signs and the songs. By weeks 4 and 5 we are all ready to have a great jam along to the music – signing and singing our way through the full 21 songs with the little ones. We have time in each session for chatting to other parents, and we provide refreshments and snacks too. It’s a great way to make friends for both you and your little one! This course is great fun for babies aged 6 months to 2 years old. The best time to start is when your little one is sitting up by themselves and beginning to use their hands for clapping and pointing. Cost: £40 per parent/carer and baby for the 5 week course – course fee includes 1-month free access to the Baby Signing Parents Zone where you can view all our signing DVDs and handouts. Also includes tea, coffee and cake!